Why are we fascinated by psychopaths? 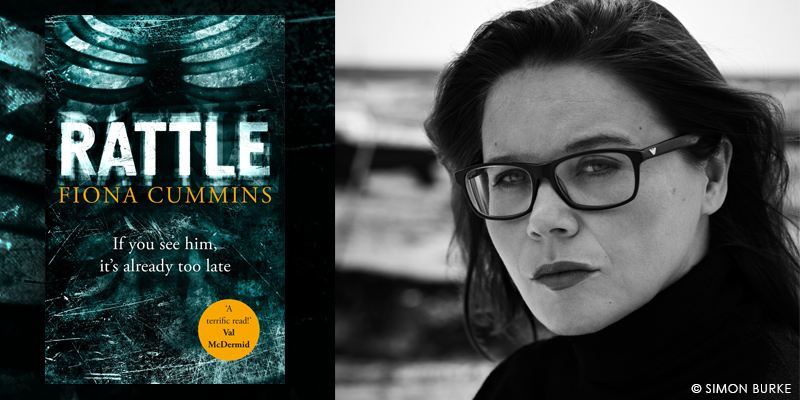 Fiona Cummins, author of Rattle and creator of one of the most frightening serial killers we've come across in decades, on why we like to read about psychopaths. From crime thriller books to true crime podcasts and documentaries, our fascination with the dark side of the human psyche shows no sign of waning. Here, Fiona Cummins, author of Rattle and creator of one of the most frightening serial killers we've come across in decades, considers why we love to read books about psychopaths. Take a closer look at the sleeping face on the pillow next to yours. What lies beneath the smile of the commuter on your morning train, the hospital porter pushing your trolley, the neighbour offering up a cheery wave? Of the thousands of connections we make every day, the shoulders we brush, the hands we touch, the brief snatches of conversation we exchange, there remains one truth. And I believe it's this universal certainty that drives our obsession with psychopaths in fiction. From the shiny malevolence of Gone Girl's Amy Dunne to the grotesque violence of American Psycho Patrick Bateman, both present a respectable face to the world. In Dunne's case, it's that of victim and wronged wife while Bateman is a Harvard graduate, has a glamorous fiancée and works as an investment banker on Wall Street. Behind the scenes, though, both are emotionless killers. In Bateman's case, the lines between reality and fantasy are blurred, and we are never quite sure if the extreme nature of his depravity is merely wishful thinking. But there is no doubt that both he and Dunne are calculating, manipulative and devoid of empathy behind the façades they so cleverly construct. The truth is we can never know what happens when the door is shut and the blinds are drawn, or when the darkness descends, blotting out the light, and that is most frightening thing of all. Of course, it is not just the terrifying notion of monsters disguised as lovers, friends and neighbours that haunt our dreams. There can be no more memorable psychopath in fiction than Dr Hannibal Lecter, the psychiatrist and cannibalistic anti-hero of Thomas Harris' brilliant book The Silence of the Lambs. With his uncanny ability to delve into the psyche of a trainee FBI agent, Clarice Starling, and the serial killer she is tasked with tracking, he uses his intellect and the personal snippets of information he gleans to simultaneously assist and taunt her. But what fuels our appetite for these terrifying figures in fiction? What is it within us that hungers for this glimpse into the darkest reaches of our most primal fears? My own début novel Rattle features a killer intent on 'collecting' victims with bone deformities for his family's museum, and the shattering impact it has on the families of the missing children, and the detective investigating the case. Many readers have commented on how strongly they empathise with those parents in the grip of a scenario more devastating than any of the most sweat-drenching of nightmares. And that's why I think we search out these stories. Because it's a way of processing our darkest fears in a space which is safe. It's a way of touching the horror of loss and grief without living it. It's a way of getting as close as we dare to the shadows without stepping out of the light. Because we all fear the faceless killer who has the capacity to deform our contented lives into something twisted and broken. We are both drawn to them, and repelled. And perhaps we seek out psychopaths for another fundamental reason, so that one day we may recognize them, saving ourselves and those we love, if they ever come knocking at our door. For more on the darker side of fiction, check out our Book Break episode below, all about the worst villans in literature.